John was born in Bulshall, Cambridge, in the June quarter 1887, the son of Warren Beecher (Grocer/Coal Merchant ) and Mary Ann (née May) Wheatley. In 1890 (Census RG 12/2778) the family moved to 8 Dale Street, Buxton, and the Census shows that John had three older sisters, Katie Mary, Annie B. and Ida Elizabeth, an older brother, Cecil M., and one younger sister, Sarah Pittet. Ten years later (1901 Census RG 13/3269) another daughter, May Futter, had been added to the family, which had moved to 5 Scarsdale Place, Buxton. The family had moved again by 1911 (Census RG 14/21241) to 29 Market Street, Buxton, and John was working as a "Grocer's Assistant". 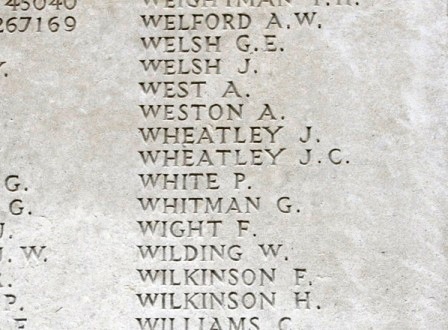 CWGC Records show that after the War John's parents moved back to Scarsdale Place. John initially enlisted in the Northumberland Fusiliers at Chilwell, Nottinghamshire. His Service papers have not survived and without them it is not possible to say what his War service postings were. His Medal Index Card shows that he entered the War in France after 31st December 1915, as he was not eligible for the 1914-15 Star. However, his original Service Number, TR/5/1830, shows he was a member of the Territorial Force, and by comparing with others with similar numbers suggests an enlistment date in March 1916. By a similar process of deduction, John's posting to the 1st Battalion would have been around October / November 1916. In 1917 the John's 3rd Division were engaged in The Battle of Arras (9th April - 16th May), and in particular the actions during The First Battle of the Scarpe, (9th - 14th April); Second Battle of the Scarpe (23rd -24th April) and The Battle of Arleux (28th - 29th April). Later in the year came The Third Battle of Ypres, (31st July - 10th November) and the Division fought at The Battle of the Menin Road Ridge, (20th - 25th September), immediately followed by The Battle of Polygon Wood, (26th September - 3rd October). "The night of the 25th/26th was quiet. The assaulting Battalions went away at 5.50 a.m. after two hours intense bombardment. ...... At 7.00 p.m. a report came in that the 8th Bde had broken and that the Germans in large numbers were advancing along the North side of the railway embankment." The Headquarters Company then made a number of dispositions to meet the emergency, such as taking up defensive positions to guard the embankment. However, " .... The report proved more or less unfounded, the 8th Bde. has only been forced back 150 yards of the WEST side of HILL 40. The following Officer Casualties were sustained, 2/Lt J. JACQUES, killed; 2/Lt N.E. TRAVELL, wounded." One Officer (2/Lt. Joseph JACQUES - named above] and 9 other ranks, including John, were killed on the 26th September 1917. 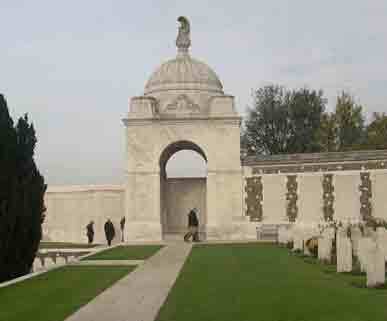 All but one has no known grave, and, like his comrades who died that day, John is commemorated on The Tyne Cot Memorial. A further 11 men fell during the rest of the period of the Battle. in his new unit 36977. To support this a Soldier of the Battalion with the Service Number 36973 enlisted on the 9 Sept 1914.
obvious sequence, ranging from 1915 through to 1917. · Another Buxton casualty, Private Charles Halstead POOLE, also of the 1st Battalion, died on the 20 November 1917. His Service Numbers, 36947 (Formerly: TR/5/1820) are very close to John's and their period of Service must have been very similar. · I am grateful to Colin Taylor, John Sheen and Graham Stewart for information on the numbering system and the Battalion History.